Nose: An intense smoky start on the nose accompanied by peat, ashes, soot and smoked ham. Delicate fragrant fruity notes shine through with apricots and lemon drops, followed by cereals, barley sugar and lingering vanilla. Very appealing! Palate: Lovely sweet and fruity start on the palate with barley sugar, apricots and citric fruits. This is immediately followed by bold and intense notes of peat, smoke, oak, cracked black pepper, cloves and tar. Very warming! Once the spiciness fades, notes of smoked ham, acacia honey and sweet vanilla nicely linger towards the finish. Finish: The finish is long and sweet with warming peat and creamy honey on the tongue. Becomes a bit drier on the tail with oak, tender smoke, and a whiff of sea salt. 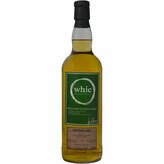 With water: There's more cereal notes coming through on the nose with a few drops of water, while the fruity and peaty flavours are slightly tamed. On the palate, however, water significantly enhances the warming spiciness, supported by adstringent oaky tannins. Peat, smoke and the tiny sweetness are almost gone. The finish is long, warm and very dry with peat, ashes and a touch of brine. Comments: This is a rich, intense and full-bodied whisky. Well matured, attractive and highly drinkable. A smoky and spicy challenge of the taste buds! The peaty and medicinal flavours are perfectly balanced with the fragrant sweetness and fruitiness of the bourbon cask. This whisky works pretty well for me, however, without any water added. Good value for money, too! Nose: The nose offers a significant amount of peat smoke along with dirty notes, soot and ashes, flintstone and gunpowder flavours. The sherry is rather big with fruity sweetness' coming through, such as oranges and strawberries. This is all complemented by lingering spice, pepper and nutmeg with some medicinal tones, tar and iodine. Bold, rich and complex! Palate: WOW! A giant explosion of peat smoke, umcompromising, warm, hot, even burning. Full-bodied with a sweet sherry taste, creamy though with crisp malt and lingering spice, white pepper and citrus notes. Thick and dry taste of dark chocolate and bitter orange with delicate smoked bacon. Enormously mouth-coating. Finish: Extremely long and warm finish. Malty sweetness at first but turns into a dry, spicy and tarry end with tobacco leaves, leather, cracked pepper and smoke. With water: There's more fruit on the nose and an increased spiciness on the palate with slightly more bitter notes. Water, however, doesn't tame the peat smoke. The finish is warm and bold still. Comments: What an experience! Caution! - this is a kolossal whisky - vigorous, explosive, rough and heavy. 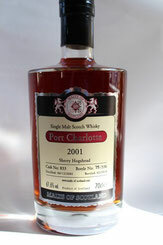 A hard-line sherried Port Charlotte. A dram for experienced peat-heads and hard-core sherry aficionados.